One of my aims this summer is to visit and tour each of the Ten Historic Sites in Portsmouth. Last month during my friend Pam’s visit, Pam and I jump started my aim by visiting the Tobias Lear House and the Wentworth-Gardner House, two historic homes on Mechanic Street in our fair city. I nearly swooned when my eyes caught sight of a most beautiful crocheted spread covering one of the beds in the Wentworth-Gardner House. Simply stunning, as you can see by the close up photo I took after receiving permission to do so from our tour guide. Is this a vintage piece of crochet work? Or is it contemporary crochet which looks vintage? Hmm. I guess I need to stop by the Wentworth-Gardner House again on one of my daily walks and ask the folks there what they can tell me. 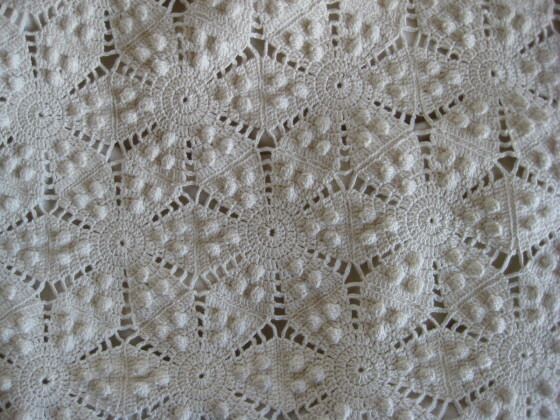 I sure would love to crochet some pillow covers in this pattern.